Exclusively designed and sold by Bootstrap Farmer, the only 72 cell trays you will ever need. Understanding that farms are NOT a place for fragile objects, we decided to produce these trays for our own farm based off our own dissatisfaction with the flimsy and brittle quality of the other trays available online and in the big box stores. Tired of wasting money and putting more plastic into the landfills, we decided to produce trays that were thicker, could carry more weight and withstand even this farmers abuse. We are a small family farm in Eastern NC where we grow our own produce for a farm-to-food truck concept. We grow lettuce, kale, chard, microgreens, tomatoes, peppers, onions, you name it. We'd love to know what you've got yourself into, so feel free to contact us to chat about it! 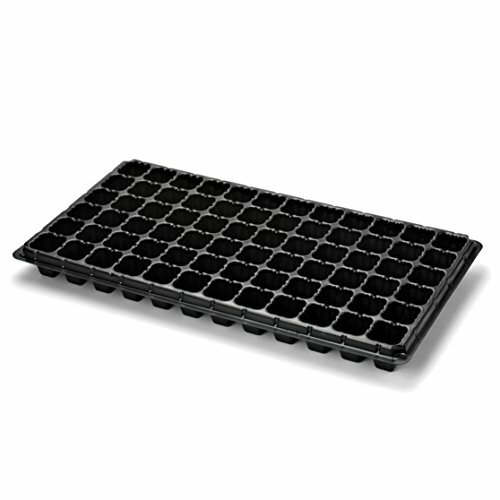 Key Features: Extra Thick Black Plastic Seed Propagation 72 Cell Trays WITH Drain Holes. These are meant to be reused over and over, season after season. They are perfect for vegetables, herbs, flowers and germination of seedlings in soil or hydroponics for hobby or commercial growers. These will fit into any standard 1020 flats, including our super durable flat trays, sold exclusively by Bootstrap Farmer. Cells are a bit wider on the top and slightly tapers to the bottom, with drainage holes. The drainage holes allow for roots to continue to grow through the bottom of the cell tray, if desired. They are large enough for roots to find their way, but also small enough to hold moistened vermiculite in place. Makes a great bundle or kit with our Extra Strength 1020 Flat Propagation Trays or our Ultra-Durable Humidity Domes. Cell is 1.5" square by 2" sitting above bottom of 2.5" flat. Germination tray is 21.25" x 11.25"